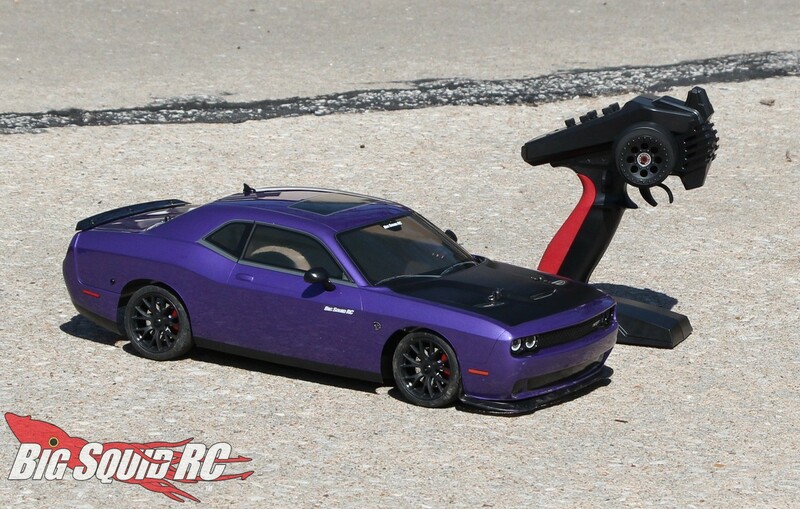 Kyosho Dodge Challenger SRT Hellcat Readyset Review « Big Squid RC – RC Car and Truck News, Reviews, Videos, and More! What’s Needed To Complete: The Hellcat comes completely pre-built, but you will need to supply a battery pack for the car, a charger, as well as four AA cells for the transmitter. Otherwise, it is pre-assembled and ready to rock-and-roll. Build Quality: Our test crew could find no fault with how the car was assembled. All the screws were tight, the shocks were well filled and not leaking, the pinion/spur mesh was spot-on, etc. 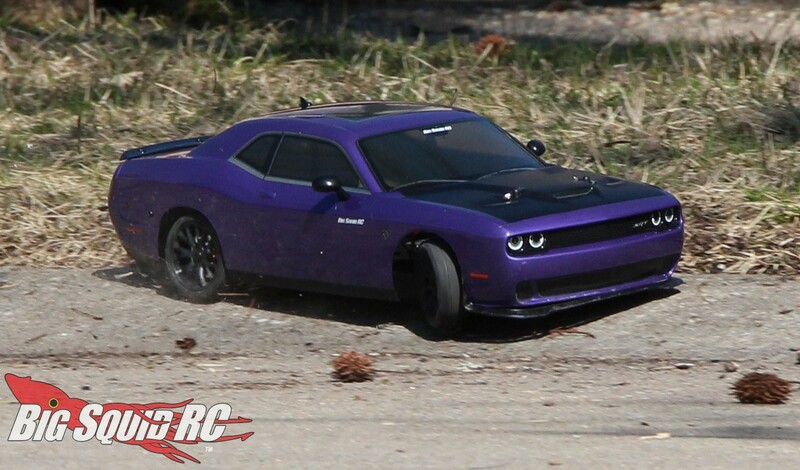 Set-up Notes: At BigSquidRC we always test ready to runs (known in the Kyosho world as a Readyset) bone stock, and that was the case with the Hellcat. For power we ran the car on a quite peppy MaxAmps 2S 5250 LiPo with MaxAmps AA cells in the Syncro. Oh ya, charging duties were handled to perfection by a Hitec X1 Pro. Turning: The Kyosho does not turn like a high-end touring car, but it turns well for new drivers. The Hellcat generally corners in a neutral fashion, which makes it very easy to drive for first timers. The stock servo has plenty of torque, but it is slow, which also helps newbies get a feel for the hobby. The tires are not “race” soft, but we actually liked their harder rubber for breaking the car loose in corners. 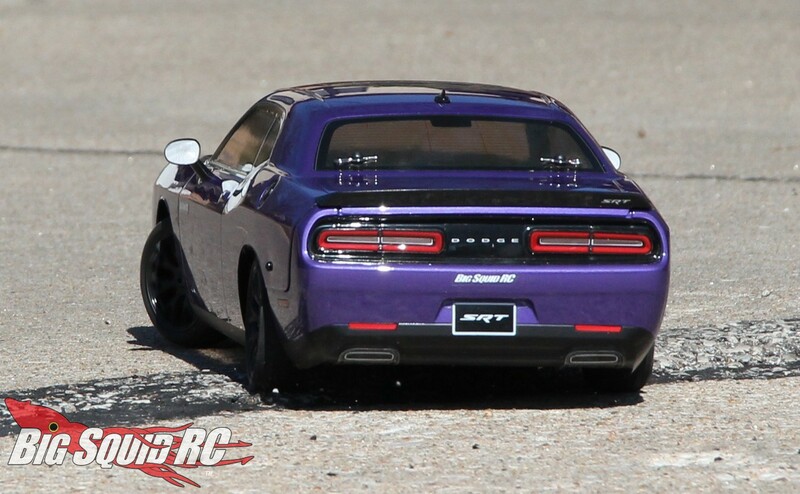 Of slicker surfaces like polished concrete the Hellcat was actually quite fun to drift! Jumping: No, jumping a tenth scale on-road car is never a good idea, so we had to do it. 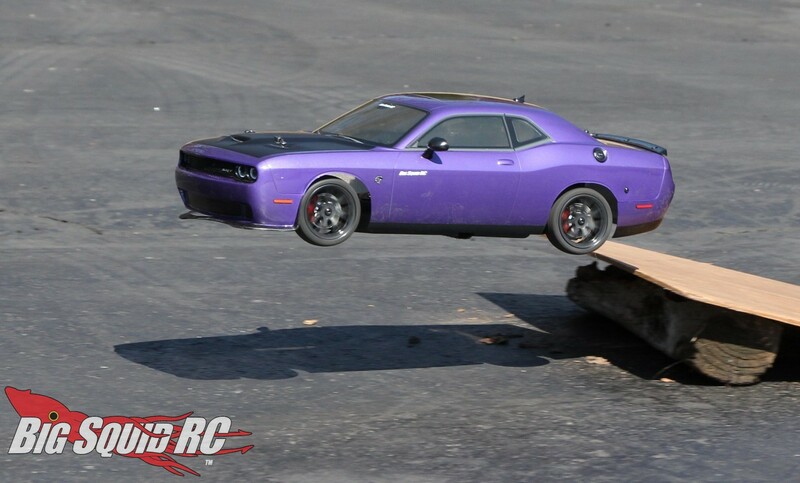 We know “big” jumps just don’t work well with on-road cars, so we kept our ramps (and airtime) small. 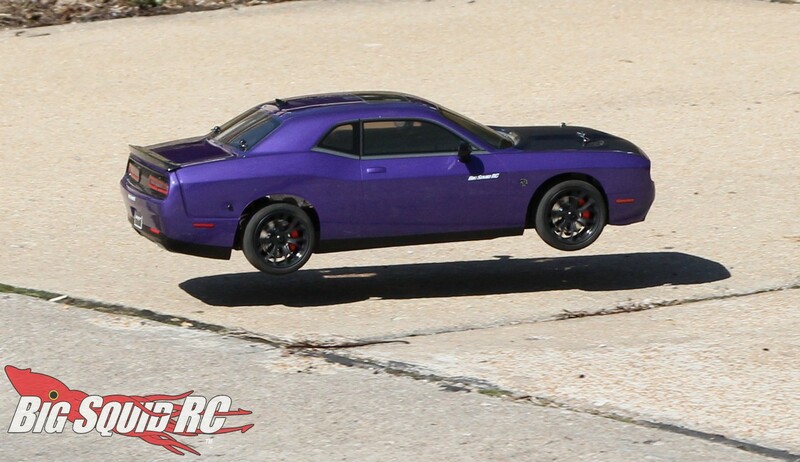 With realistically sized jumps, the Hellcat was a ton of fun to drive! On-Road: How well did the Kyosho drive on-road? No, you won’t be blowing by full-race touring cars, but for “basher” driving- like running around a cul-de-sac or driving around a large empty parking lot, we loved how the Hellcat drove. Overall its handling was quite forgiving and easy to drive. The stock tires aren’t crazy hard or soft, they are more of a medium compound that yielded ample traction and low wear. Large pot holes are taken in stride by the Kyosho, but being an on-road car with limited suspension travel, it would easily bottom out in rougher areas. And while 27 mph simply isn’t crazy fast, it had good yank out of the hole. At the end of the day, we were impressed with the on-road capabilities of the Hellcat. Oh ya, one more note. At higher speeds the Hellcat tended to bounce around a bit, but at lower speeds it looked incredibly scale while being driven! Grass: Ya, just say NO. If you wanna tear up some grass we highly suggest you cut the check on a Kyosho Mad Crusher instead. Tires: Like we mentioned above, they aren’t super soft, so you don’t carry a ton of speed through corners. However, being a bit harder makes the 14 turn brushed motor seem a whole lot faster when drifting on slick concrete or dusty asphalt. They also have a good looking street tread. Power: While the Hellcat only comes with a 14 turn brushed motor, it still feels quick. Tenth scaled touring cars are quite light with very little rotating mass, therefore a good brushed motor can feel quick. The Hellcat with a good battery has enough yank to burn all four tires off from a dead stop on most surfaces. It also has enough power for donuts, and even full blown drifting on slicker surfaces. No, you won’t break your radar gun with the Hellcat, but it has more than enough power to feel really fast to a first timer. It also had more than enough power for our seasoned test drivers when driving on slicker surfaces. Radio: Three of our test guys didn’t say a word about the included Syncro, one raved about it, and one shrugged his shoulders and kept driving. At the end of the day, it did its task well with few virtually no complaints. Broken Parts: For some reason, the Hellcat looked fast sitting still. Therefore, we drove it like we stole it from day one. There was just something about it, like it was impossible NOT to drive WFO. Any which way, our test car received a lot of abuse. The plastic (like the arms, towers, hub carriers) soaked up all sorts of ugly without breaking, but somehow we blew up the front diff, thus leaving us with only rear wheel drive at the end of the review period. That body, wow! That color, wow! Seriously, somebody give Kyosho a pat on the back for the Hellcat, it may be a polycarbonate body but it is well detailed and looks gorgeous! However, that body could look even better. We would LOVE to see this car come with hidden body mounts. The battery tray has decent room and is fast and easy to use with a single velcro strap. While the steering servo isn’t fast, it has more than enough torque to get the job done. Drivers who dig fast servos will need to switch out the stocker, but for most drivers the stocker gets the job done without issue. 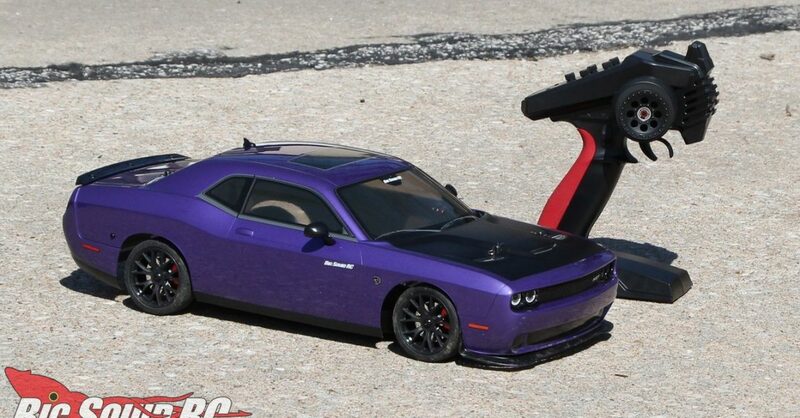 Best Mod: Ya, that would be a brushless system of some sort, it is a tire destroying Hellcat after all! Time To Bash: B The cars comes completely pre-built, this allows you to get driving in minutes, compared to hours. Workability: B The Fazer chassis has an open layout that is easy to wrench on. Also, we liked the supplied metric/hex hardware. 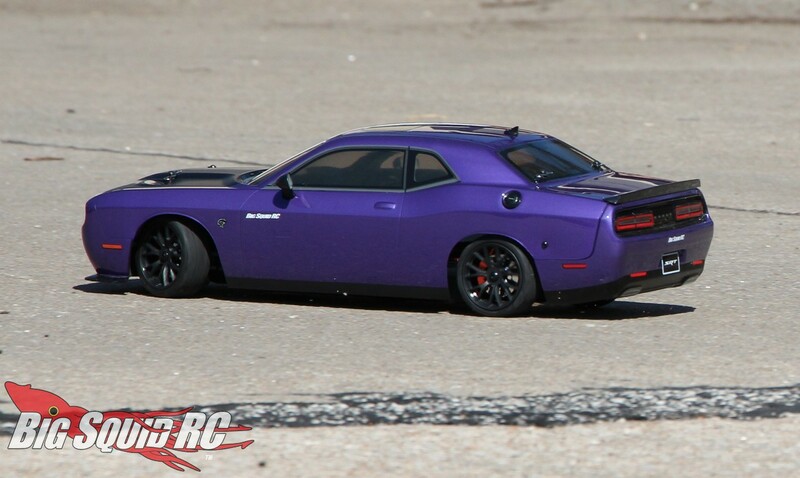 Car Show Rating: A Kyosho crushes it with their Dodge Challenger SRT Hellcat. The body is incredibly well done with scale detailing from nose to tail. The wheel/tire package also looks the part. Long slow clap for Kyosho on this one folks…!!! Bash-A-Bility: B Our test unit took a fair amount of abuse before breaking for the first time. 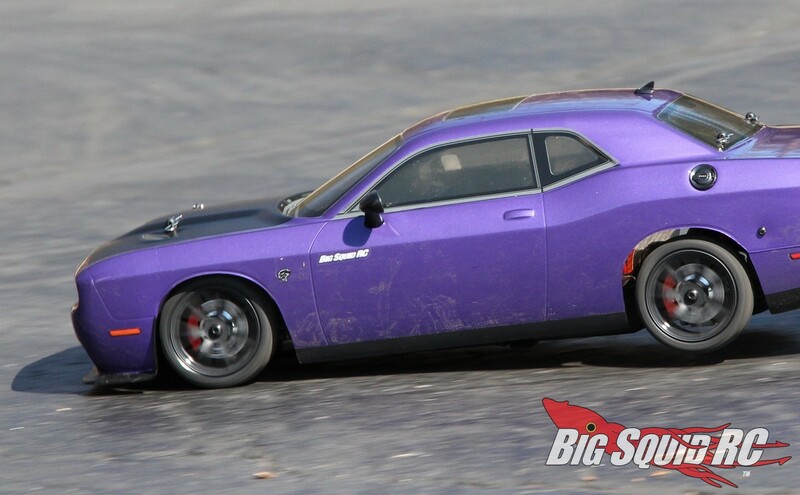 Fun Factor: B The Hellcat drives in a realistic manner on smoother surfaces, a fact that really adds to the fun. Handling: B Nothing fancy here, but we liked how easy it was to drive for first timers. 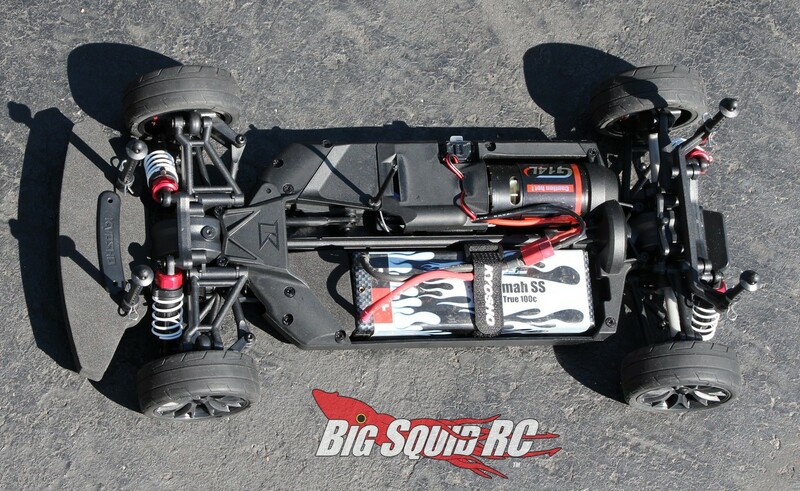 Value: A $219 is a relatively low price point for a “hobby grade” rc car. 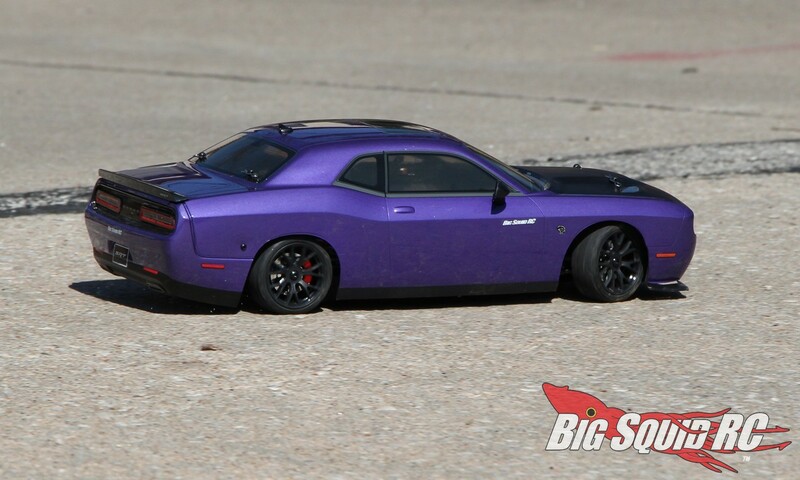 With a gorgeous body, durable chassis, and legendary Kyosho design, we consider the Hellcat a great value at a sub-$250 price point. Parts Availability: C While we didn’t find any parts at our local hobby shops, we were easily able to find them on-line. 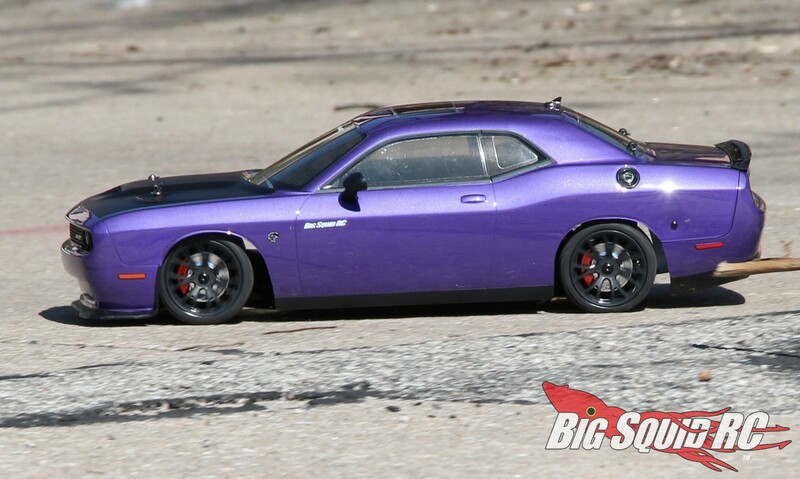 BigSquid Rating: B We found the Kyosho Dodge Challenger SRT Hellcat to be a solid on-road car. 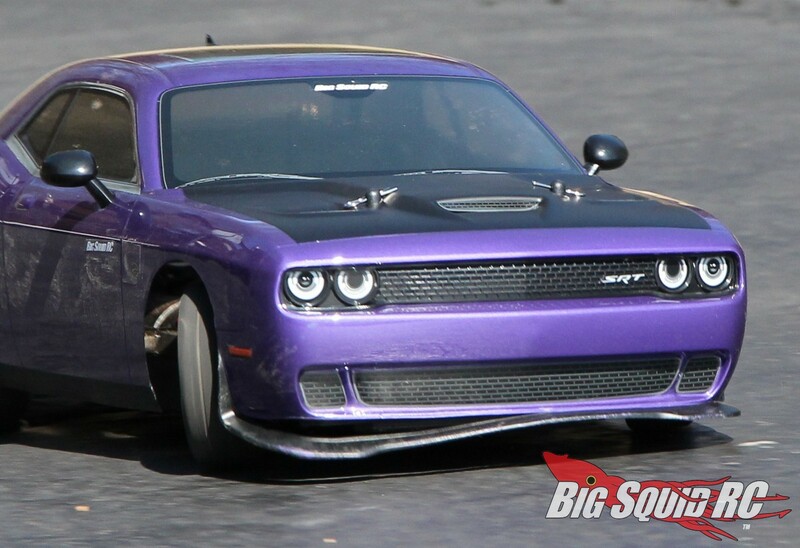 The chassis drove well and was quite durable, while the outrageous purple Hellcat body turned heads everywhere we went. We are big fans, cut the check!